I dropped out of sight for a while. Life has a way of overwhelming us sometimes and the only way out seems to be tackling one task at a time, ignoring the rest. Piece by piece the puzzle clarifies, takes shape, forms and resolves, if only one can keep putting one foot before the other, doggedly completing one more task towards the goal. In resolving Mother’s estate, I’ve come to the point where I have to sell the house. Otto, with much protest, finally left Mother’s house. Although he was to be out by September 30th, his affairs still are encumbering various rooms. His son, my nephew Ron, helped him finally take his accumulated goods stored in the garage yesterday – October 27th. He left behind all the things he doesn’t want – debris really. I got someone from our family’s church to come take possession of anything amongst these that they thought they might sell at the thrift shop and that was helpful to me, Otto and the thrift store, so that was a good thing. I’m annoyed that there are many of his things still left to dispose of – dismantled IKEA furniture that he cannot use in his new apartment, boxes and boxes of empty wine bottles for his unrealized wine-making projects; tools no longer useful because they have been left to rust; unspeakable debris – dust, spider webs, scattered screws, badminton rackets and squash rackets, camping lanterns, sleeping bags with burn holes in them; lids to baking dishes; useless kitchen ware that has sat outside, boxed in the garage for the ten years he lived with Mother and me. There is more, but I won’t keep you enthralled with the grime of it. What is driving me now is the Realtor. I took two weeks to interview Realtors and found an excellent one to sell the house. He’s holding his first open house for other Realtors on this coming Thursday. From start to finish, that gave me ten days. My dear lovely Heather and her dauntless husband complete with pick-up truck and a U-haul trailer came from Sechelt to help me, with some vested interest. Heather was taking away a load of furniture – Mother’s bedroom suite, some teak arm chairs; the 1950’s teak stereo set, a marvel of Danish craftsmanship; a mattress and box spring; boxes of Lavender Rose china dinnerware; familial linens both for table and bed; and assorted treasures. Dauntless husband is a real treasure. He was able to lift massively heavy things with engineering tricks – rolling them down stairs and across lawn and sidewalks out of the house and to the truck with a dolly, leveraging the weight of the furniture with two-by-four planks on to the truck, sliding things on mats and rugs. We two sisters helped, but without his manly packing tricks and muscle, I would never have been done clearing out the house. It saved me having to select a mover and find storage (mind boggled as I am, this is one of my daunting thoughts). Now the work was done and over with. To me it was an incredible feat and I am bottomlessly thankful for his generosity of time, brawn and expertise. Heather and I sifted through the small things. The storage shelves held things stored for forty years and more. There were the crewel stitched, tulip patterned drapes that had graced the dining room in our house in Vancouver which we left in 1956. There were other fabric treasure, surely not useful, of similar vintage. There were large pieces of beautiful burlap that were intended for some project or other that had stayed in the wooden steamer trunk, unfaded by time by virtue of their forty year exclusion from air and light. What had Mother intended for these? All for naught. A forty year list would be too long for here – and boring. But there were treasures. In a large paper bag, four feet by two, there was a cotton sheet wrapping something precious. Marilyn Munroe would have died to have this dress. All frothy pink netting on the outer layer, it was strapless with a white netting froth of trim along the top of the bustier shape. It was form fitting to the waist with whale-boning inside. These were covered over with a fine black trim that descended in arrows to ten inches below the waist as the skirt flaired out into a crinoline supported fan shape. She must have looked just like a princess, a movie star. At five foot eight in her glory days, she must have been so thin to wear this dress – a size ten or so, I guessed. Who had made it for her? It was all hand stitched on the inside. A marvel of couture construction. Heather also found a tin box that had once held shortbread, with a picture of King Edward VIII’s coronation memorialized on it. His reign was so short, it must be rare. It contained precious family letters which are a real treasure. Heather and Dauntless Husband left on Friday morning. They had medical appointments to keep in Sechelt. They had both worked like slaves and for long hours. I was so profoundly thankful for their help and yet my heart sunk at the remainder to be done. On Friday after they left, I hopped in the car and headed back to the house. I had made an arrangement with Sheri at the Thrift to go straight there first, so she would know that I was back and so that she could come pick up another batch of goods. On arrival, I could not help myself but look through the Thrift to see if there was anything I wanted. I found an original painting, badly framed, water damaged on the framing, waiting to be rescued. While there I met a Mexican lady who was helping with the work. I asked her what had brought her to Canada. She was wife of a visiting professor, a researcher in Engineering. He had Immigration status on an exchange basis, but she, with her Masters in Business Administration, was not permitted to work and she was here at the Thrift, looking for some contacts and useful volunteer work to keep her busy. Knowing that I was cleaning out the house, she offered to come and help me with the rest. I was sorely tempted to have help, but I declined. Cleaning was hardly the kind of work to ask a visiting professor’s wife and a professional in her own right to do and I said this to her. She protested. I thought about Mother and Father, the year they went to Columbus Ohio for Dad to finish his Doctorate degree. Had someone welcomed him in with simple kindnesses. But Mother had been studying. She would not have been at wit’s end to entertain her active mind with simply anything. I remembered my four months in Montpellier, accompanying Franc on a new job, sitting day after day alone in a studio apartment that we could ill afford. I never once was invited into another person’s house. I never spoke in a friendly manner to any French person even though I could speak French fluently by that time. Though I had my amusements – letter writing, painting, reading, walking – I almost went crazy with loneliness, the want of a friendly chat. I went walking in stores, talking to store clerks just to hear a human voice in the long hours that Franc was away working. I would have been so grateful for the opportunity to meet another person, to have conversation, to exist outside of myself. And so I did. I let her come, and we made our arrangements. She was not free on this day, but she would come tomorrow. But she had furnished it quickly with furniture from the Salvation Army and the Thrift store. People who knew them had given them things. The only thing she missed was having access to a laundry. We worked away. We cleaned, room by room. Not the heavy cleaning – a company is going to do that. They will come and spit polish the place for the showing. While I sorted, she took a broom and swept up the dust balls. We gathered every last thing in the kitchen. She washed the dishes; packed up some remaining glassware for the Thrift. When her laundry was dry, she called on her husband to come take it away along with the few things she had decided to take . There was a book case, the shipping to my house would have been more expensive than buying a new one here; a simple side table in plastic laminate; a glass vase; a few cooking vessels and utensils. Miguel and his son Miguel packed away their new possessions and came back to lift and pack all the boxes I was bringing back to my home to sort and dispose of. I didn’t have to pack the car, this one more time, and I was grateful. “Oh no!” I demurred, ” I should probably head off for home.” I was thinking that they did not have much. What’s stopping you? Where have you to go? Who is waiting for you? Would you not have loved some simple company when you were travelling, living in a foreign country, especially company of the locals who would help you understand their country and their ways? And so I went. Miguel the father departed immediately to make the lunch. Diana and I wrapped up our day’s work to give him time to set his cooking pot going. Half an hour later, we arrived at their basement suite, just at the corner of the lane. It was a one bedroom basement suite with the only windows at the top 18 inches of the North wall. “See?” she said excitedly to me,” here is the book case a friend gave to me.” That was me. “And we love the lamp” It was casting a warm glow into the room. “And the vase.” It already had a few colourful autumn twigs in it. I subtracted these few items from the room and thought “How barren this room must have looked without them. How those few things had brought some home-like grace to it”, and I was glad for them. We sat down to a delicious repast of Basa filets stewed in a butter sauce laced with a chemist’s brew of kitchen spices, marinated fresh tomatos, fluffy rice and a dinner roll. We held hands for a blessing of the food and the gracious kindness of the Lord in providing new friendships. We shared a glass of dry red wine and toasted our acquaintance. The table fell silent as we ate, then with a bit of cherry ice cream sitting on our plates before us, we chatted for another two hours non-stop as if we had always known each other, as if we had been friends since Methusalem. It was four in the afternoon when I left. The day had been brilliant in the morning. It had become lightly overcast with high thin clouds above. As I drove out the number one highway towards Maple Ridge, the autumn oranges were tempered in a blue haze, blending the landscape as if in a soft pastel drawing. Mile after mile, kilometer after kilometer, the verges of the highway were dressed in crystal clear images that David Lean would have waited months for, had he been filming. My heart was full of happiness. Then at the Pitt River Bridge, I saw the trees on the river’s edge, just recently turned to lace with the last fall of leaves silhouetted in black against the pale peach sunset and the pale, slate blue sky. They were reflecting in a perfectly calm river. It took my breath away. I could barely look at the road for wanting to fix the image in my brain, and I was driving! 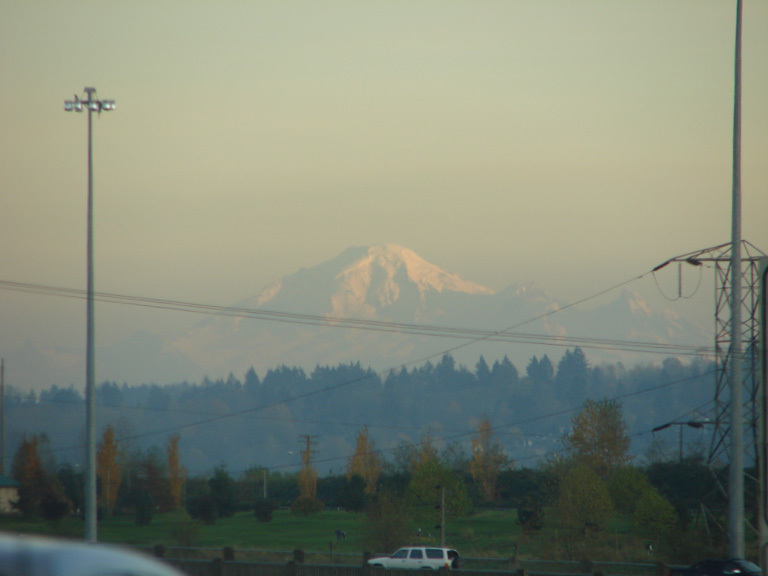 Just after crossing the bridge, there was Mount Baker completely visible and clear, pink and blue in the dusky light. The wonder of the Pitt River Bridge trees was blasted out of my memory as I drank in this new, beautiful image. Then I was past it and onto the Old Dewdney Trunk Road, the last stretch to home, through the Pitt Meadows farm lands. Looming before me was the series of barn red outbuildings – including a traditional shaped barn – stretching like a panoramic photo – underscored with a thick swath of brilliant red blueberry fields. That same dusky pink sky sat behind it all. I was contented. I thought nothing could be better than these things I had just seen, but as I approached the red outbuildings, Mount Baker reappeared and made a background to the red barns. Oh, Lordy! And no place to stop to take a photo! I was home not long after. What a glorious day, for one that had started off with such misgivings. How fortunate am I! Praise the Lord! And I have a new family of friends. I haven’t written lately. I’m up to my eyeballs in alligators, Mrs. Stepford says. It’s true. I’m emptying out Mother’s house now that Otto has finally gone. There is still a ton of stuff, the accumulation of 38 years living in one house. It’s not interesting stuff, for the most part, but yesterday, looking through a box that appeared to be mostly throw-away or thrift shop fare, I found a wee box, a lovely looking box, about four inches square and two inches deep. It was in amongst books from the ‘thirties, dusty and worn with much handling. When I lifted the lid, there was Mother’s pale blue bridal veil. It was so fragile and ethereal that I quickly put the lid back down. It wasn’t something I wanted to inspect amidst the dust and dirt that was surrounding me. Just underneath that box there were two albums of family photos from early days in the pioneer community of Ashern, Manitoba in the Interlake district. When I get some time, I will scan these and add them to the family saga. When I lifted these and put them carefully aside, photographs and precious papers tumbled out. There are people that we no longer know and now there is no one to illuminate their identity. One of the pictures was of my great grandparents from Holland. When I looked at it, I wondered what they thought of this new country that their sons brought them to – so vast, so very hot in summer, so very cold in winter, so wide open, so wild, so isolated. After the closeness of things and the cultivation in Holland both in the sense of civilization and agriculture, it must have been a huge cultural shock – more so than it is today.Another treasure lay just below. It was a soft doeskin-covered photo album with a native Indian head painted on it. This hand-made treasure had mother’s name burned into it with a fine tool. That must have been how the drawing of the Indian was done as well. I have carefully put these aside now so that I can take some respectful time with them. There’s something wonderful about ancestral photographs; explaining the joy that it brings is almost impossible to describe. What is it that drives us to record our passing through this mortal coil? What drives us to garner the flotsam and jetsam of our daily lives into a historic document that only our own family will probably appreciate – and even then, the younger folk are barely interested in where they came from. This used to annoy me. I wanted to know the family history. When finally she relented and I managed to get her to look at the old, treasured photographs with me, she could no longer see. Her macular degeneration had robbed her of her vision and only the peripheral images could clarify. Well, that’s it for this bit. No time for poring over pictures yet. I promise myself: “It will come. It will come,” but I am eager for the day when the Estate is settled and I can paint and create to my heart’s content. She came in the back door holding a small geranium plant pinched between two fingers. I could tell by the look on her face that I was in trouble again. If not me, it was someone else. “Who took the geraniums out of the pot?” she said sharply. It was the latest of mysterious violations of the garden that had occurred, probably in the middle of the night. Mother was quite suspicious more often now. She felt there were prowlers about. Unusual noises and unusual events made her nervous and vulnerable. She became critical of my “management” of the house and the environs, and yet she was utterly dependent on me now. The previous week, we had lost the whole crop of pears from the tree in the back yard. The day before she had tested them and she suggested that in two more days they would be perfect to bring in. I relieved her of the offending plant that was trailing bits of dust and root upon the kitchen floor and took it down the back steps to a large planter that I had used for summer annuals. Indeed! It had been dug up and sloppily. There was dirt surrounding it scattered on the cement sidewalk. I took a small trowel and began to prepare a hole to put the geranium back in. To my consternation, I found potatoes had been planted instead. This truly was silly! Ridiculous! Who would plant potatoes in a flower pot? I pulled out one of these red brown potatoes only to be confronted with another amazing thing. What had been planted, inviolate, no tears, no scars, no nicking of the skin, were the pears off the tree! I pulled out the pears and stuck the geranium back in, tamping it firmly so that the roots would survive their adventure out of their element. “Good news and bad news!” I declared to Mother as I reentered the house. I told her what I had discovered. Not many days later, I watched a rat climb the pear tree for one of the three remaining pears. It was hanging on the end of a fragile branch and the rat was fearful of falling. It gingerly descended the branch and extended one short front paw out to bat the pear from the stem that held it to the tree. It took a long time, advancing, losing balance and regaining it, tamping that unsteady, wavering branch, his fat, well-nourished body trembling only slightly higher up on the same branch. As I was out in the yard tending to garden maintenance a few hours later, I noticed that he rat had succeeded in getting the pear to the ground. There it lay, a plump ripe pear with little teeth marks indenting its surface. I never told Mother about the rat so that it could not trouble her already active sense of vulnerability and doom. I’ve been silent for the last week or so, too busy to write. So as a bit of introduction to this post, I travelled to Sechelt by bus on Friday to visit my sister and her husband for the Thanksgiving weekend. The bus trip is another story – but for now, I wanted to say something special for this holiday which is all about family connections, thankfulness for what we have not just today, as a festival, but thankfulness for our lives and how we live them. In the morning, Heather and her husband went out to their exercising activities and left me home alone. I went rummaging in the basement, unfamiliar with their organization of household tools, looking for secateurs and a trowel. I found a sorry looking pair of secateur but not the trowel, and settled on a rake and a shovel to augment my weapons for the garden. A bear has been sighted garnering all the fruit he can get from local yards and Heather’s is no exception. There were two calling cards left, one just beside a dwarf apple tree and another right in the vegetable beds. The bear is nocturnal, so we haven’t seen it, but it certainly has made itself felt. The low branches of the apple tree are perfect for fruit picking. If the bear gets there first, well, there is no apple crop for us! There is certain evidence that he has been helping himself. Heather’s garden always needs an extra hand. I went down to the lane and dead headed the Dusty Miller that grows in a giant clump about three feet tall, and gave a hair cut to the Shasta Daisies that were looking bedraggled with their soggy looking brown buttons, seed heads, that wobbled top-heavy on their late autumn stems. The sorry-looking secateurs were very sharp and practical. Looks aren’t everything! Next to the Shastas and the Dusty Miller, lavender was growing vigorously in a large round bush shape and I left it alone. It was providing a beautiful dusty colour and a lovely perfume. It’s flower heads stood evenly five inches above the leafy base and provided an interesting texture I wouldn’t have wanted to touch. I took out a few aggressive branches of blackberry that seem to crop up everywhere, easily rooting themselves when they touch the ground, spreading and leaving spiky, wicked thorns for unsuspecting gardeners. When Heather and her husband came home, I went in for a cup of tea and a bite of lunch with them. Then, once the turkey was safely cooking in the oven filled with a sage-y bread stuffing, I convinced Heather to come out into the garden with me to enjoy the autumn sunshine. The forecast has been for rain five days straight. Saturday night the wind soughed down the chimney and rattled the plate glass windows. There was loud whistling and sighing in the house all night. The Weather Network had a wind warning for Sechelt with gusts of 80 kilometer gusts battering the coastal region. I woke several times during the night to the clap-trapping noise it produced. Now the wind had abated, was calm even, and it was a shame to waste this lovely day inside. As I explored the garden looking for easy things to do, I found a young Eucalyptus tree that had fallen over. . Heather had propped it up on the south side with a rope that held it firmly in place; but the wind had had the nerve to blow from the other direction and there was no support on the other side. We brought the tree back upright. I held it in place and she brought bricks and large stones to anchor the base of the tree in a temporary fix. I’m always wondrous at her ability to improvise solutions in her garden. Oak leaves had fallen in quantity in the previous night’s windy shake-up and the pine tree had released a carpet of rust coloured needles. The colours were lovely, but they needed to be raked. That’s an activity I like, so I tackled raking and she gave me help in bagging them for the yard waste garbage. From the pile of pine needles, she began carefully separating them and cleaning them out. I didn’t get it. “What are you doing with those?” I asked. Heather is an informed gardener, unlike me. She has read a lot about it and knows many tricks of organically gardening. This was one I’d not heard of before. I like gardening for being in the fresh air and doing tasks that I feel are meditative and intrinsically pleasing, but I’m far from being knowledgeable about it. I learn a lot from her. Then Heather moved away to do other things. I took the spade and rooted out some buttercup mallow that lives in profusion in the garden, taking over any free space to root and flourish. It chokes out other plants and I’m always happy to dig it out of the vegetable beds. It feels like I’m making progress somehow, though taking things out is not the really fun part of gardening. We’d planned an hour exactly as our time in the garden. When an hour was gone by, we needed to put potatoes to bake in the oven and start preparation for the remainder of the Thanksgiving feast. Reluctantly we gathered our tools and put them away. The warm breeze, the fresh clean air and the bright autumn sun had been wonderful. As the three of us sat down to dinner an hour later, dressed a little more formally than our earlier work-a-day attire, a glass of wine awaiting, and a meal to be truly thankful for, I counted my blessings. This is a dear, beloved sister and her husband is a fine and happy man. I’m lucky to have them in the circle of my life, and of my friendships. Every crossroad is an orifice that pulsates white or red lights into the dark conveyor belt of a highway. Under the dark sky, there is nothing clearly visible but headlights coming head on, or tail lights, following. Vehicles seem not to be powered of themselves, but drawn on by an inevitable force. I joined this slow procession at Laity Street at five thirty in the morning, crawling with all the other singly occupied cars at a pace not registering on the kph scale. It seemed as if a tap had been opened and could not be shut down until the last resident was floating city-wards on this sea of commuters. I was awed by the number of residents in our community that took to the roads at five a.m. and crawled in this fashion to work in the city. East of the highway, the direction I was coming from, the beads of red lights bobbled mesemerizingly. At such close distance to the one in front, one had to pay attention. A blurt of acceleration could result in a rear-ender bringing traffic to a halt. Not enough acceleration could annoy the road-rager behind you, and provoke an angry reaction, to be avoided at all costs so early in the morning. It was better to gently let the car drift of it’s own, inexorably forward, crawling, adding to city’s blood supply, joining the arteries that connected Vancouver with it’s worker bees. The road was clogged for many miles like this to the highway at the Port Mann Bridge and again until Brunette Avenue and then magically, the press of vehicles was gone. There seemed to be no reason for it. Where had the cars gone? There hadn’t seemed to be a large turn off of vehicles along the way. I was acutely aware of how dark it still was, a deep midnight blue at six in the morning. Only the car and city lights pierced the darkness. Where had September gone to, so quickly, that now the sun would not rise until seven? I had offers to drive me to the hospital and to pick me up. My sister would have come in from Sechelt, but it was too far to ask her to come, and she hadn’t been home for the last month with vacationing, so it was a bit much to ask her. Mr. and Mrs. Stepford offered, but of course, Mrs can’t drive because of her failing eyesight and Mr. works. He’d jut been away for ten days on a business trip and needed to be in his office, not running around the peripheral communities of the mega-city looking after me. My dilemma was solved when the anesthetist insisted I stay overnight. And so it was, o I drove myself in and parked in the hospital parkade for the twenty four hours plus that I would be there. It’s illegal to drive within 24 hours of having anesthetics administered. I was happy with the arrangment. I need to be independent as much as possible so that when I really need something, my offerers won’t have exhausted their willingness. And so there I was, daylight just lifting as I entered the parking lot at the hospital at seven twenty. O only as I was leaving, the next day, did I realize how absolutely lucky I was in finding the first parking stall open and waiting for me. Tuesday, I watched cars circle relentlessly waiting for someone to leave so that they could take over the stall. In the admissions hall, I was provided with two hospital bracelets – a white one with the date and time of surgery, my name and a other undecipherable hospitable data. The other was orange and listed drug and food sensitivities and allergies. Next, I was instructed to wait in the pre-operation lounge. There, I tackled a Sudoku puzzle to keep my mind off the upcoming fiddling the gynocologist was going to do, and when that was done, I leafed through one magazine after another, looking for something to read. An hour later, a nurse asked me to come and to change into their crumpled, blue cotton hospital gowns, one put on open at the back and the second, open at the front. I was given long green socks that came up to my knee. These had a peculiar seam at the toe end that sliced over on a strong slant. I was led to a chair where this same nurse massaged my hand until she could find an artery to insert a needle which would connect up to the intravenous equipment. I forced myself still. She taped the needle to my left hand and put Scotch tape over my mother’s thin, plain, white gold wedding ring. I had been instructed to bring neither jewellry, nor money, nor credit cards. I had not been able to get this ring of Mother’s off, not even lubricated with soap. Someone would have to cut it off to take it. I asked the nurse about the curious socks. “It’s so that all sizes of feet can fit into the one design,” she explained. I said nothing but thought that if they had been sewn straight across, they would have done exactly the same thing without leaving this curious green elf-like extension at the end of my feet. There was still a paper hat much like a shower cap and paper feet covers to go on. I didn’t want to think about anyone taking a picture of me in this curious garb. Across from me, two patients were installed in similar booths to mine. When privacy was needed, a curtain could be drawn around. These patients each had a spouse seeing them, cajoling and comforting them up to the last minute of their surgery wait. I silently cursed my pig-headed stubbornness that had led me to come head to head with both Franc and Otto in the last few months. Franc was supposed to bring me in, stay with me and drive me home. But that was off. I hadn’t seen him since July – almost three months ago now. And I’d quarrelled with Otto about the will and it’s fairness. He’d resorted to calling me nasty names. Darned if I was going to get Otto to do anything for me. So there went my back-up plan. I consoled myself that neither of them were hand holders. A dark curly-haired nurse came in and introduced herself. She looked sweet. She connected me up to a plastic pack on the IV stand and brought me a couple of pills to swallow to keep my stomach from revolting at the anesthesia. “You look really familiar,” she said. “I’ve wracked my brain to remember where I know you from. Then I saw your name on the chart. We used to rent the apartment from you. I’m Kathy O’Brian,” she said. I cursed my feckless brain that kept items of remembrance like a sieve kept water. I hadn’t recognized her. “So you got on here permanently?” I said. Small world, I thought, and a good thing I’d had such a lovely relationship with those tenants, as she went on to the other patients waiting for their turn. You never know when someone you’ve met will turn back up in your life. An elderly, bearded man came in dressed in a white lab coat. He bade me to get up onto a gurney that he wheeled away to the operating room, all the while holding the IV bag high above his head. He had unhooked it from the stand and then held it high in a pose dignified for the Statue of Liberty. There in the operating room was the anesthetist dressed in that same set of wrinkly ,green scrubs, that pink and yellow floral hood with ear-flaps down around her chin, the two unironed strings falling beneath her chin waiting to be tied in a laughable bow. Beside her was my gynecologist, a motherly-looking East Indian woman with bright red lips. Both looked curiously short, not more than five foot two, and I wondered at the marvelous success each of these women had met in their lives, each having a highly skilled and respected profession, and neither having my generation’s stereotypical appearances of a doctor. “Take her to the maternity ward on the third floor,” said a voice. Maternity ward! It was too late for me for the maternity ward. I was wheeled down the hallway to the elevator and transported to the third floor. The same elderly man pushed me into a ward room that was big enough for four beds but there was only one bed in it by the window. A nurse came and encouraged me to get off the gurney and walk. My arthritic feet did not want to stay silent as they creaked back into service. They pinched; I winced; and so I limped a little. I was feeling quite clearheaded. I’m not befuddled, I thought to myself. It’s just these feet haven’t been active in a few hours and they are complaining. I slept then for a couple of hours. I’d left the house at five thirty. I’d driven all the way in over a period of two hours and been so sleepy on arrival that I’d had to shake myself awake in the last mile or two of the journey. I’d been to bed late the night before, fussing about what to take and what to leave at home. I was ready for some catch-up sleep. I awoke some time later and felt some compassion for my mother who had become obsessive about time and date. I looked at my watch and found it was gone – left at home, I knew. In the hours that followed, I must have looked twenty times, never finding the watch – automatic reaction – and me remembering too late that I had not brought it. An aide came in with snacks and drinks. She left me some juice. I was getting peckish. I hadn’t eaten since eleven the night before. “We come at four thirty with dinner,” she said in reply to my query about food. I slept a while longer and soon dinner arrived. A nurse came in to check on me and inquire about my aches and pains. There were none and she was satisfied. I’d brought my own pyjamas and changed into them. The hospital garb was depressing. I began to feel more normal with more normal clothes on. At four thirty, dinner was left on a narrow tray table that rolled across the bed so that one could eat sitting up. I activated the bed controls but no matter how high I pushed it, I could not find a suitable position to use whereby the food could actually travel from the tray to my mouth without becoming breast-shelf decoration. I gave up and sat upright on the edge of the bed, feet hanging over, and ate. There were three very thin, machine sliced pieces of pork roast, more peas than I’ve ever seen on a dinner plate before, and a small round ice cream scoop of mashed potatoes. All was covered in a puddle of instant gravy. It was warm and food. I hadn’t had a bite nor a drink in sixteen or seventeen hours. I ate it all. The meal came with two short plastic cups of milk sealed with a foil top which I hoarded for later. Despite my orange band proclaiming my allergy to caffeine, there was a fruit flavoured tea bag sitting beside the blue thermal mug, and a few portions of packaged sugar. I drank the tepid water. When the aide came back, I pointed at my orange band and then at the tea bag.The tea was not decaffeinated. A fruit flavoured tea did not mean that it was herbal. “It has to say decaffeinated on the package,”I protested. In the three offerings I got from the kitchen, each time this fruit tea arrived. The message did not get through. So, when the nurse came, I went through the same conversation. “The government has decreed that we use contracted services for cleaning and for food services. The same employees that previously worked directly for the hospital are working for them, but the contractors are only interested in doing the least work for the most profit. Things like this go by every day. You should see how the cleaning has deteriorated,” she complained. She took me to the little kitchenette down the hall and across on the other corridor. She explained that the corridor made a rectangle that one could walk all around. In the core of it were more offices and service rooms. I had to cross to the far side for this kitchenette. She opened the fridge and showed me a shelf for nurses’ and staff lunches, not to be touched, and above that, sandwiches that people had not opened and not eaten from their trays. There was tuna, chicken or ham. There were more of those short, foil-covered milk containers, yogurt and orange juice. In the freezer there were three long loaves of white marshmallow bread. I went back to my room and sat in a visitor’s chair on the other side of the room from my bed where the light was good for reading. I was wide awake and alert. Far away down the hall I could hear a raucous sound like a Stellar Jay complaining. Soon it dissolved into a baby’s cry. I pulled out my novel, a romantic tale of two noble children who love each other and are promised in marriage. Then the the father of the girl falls into disfavour with King Henry III and the boy is made to marry another. She becomes ill, wastes away and dies. The peril of autocratic politics and the descriptions of medieval life were interesting and the story was told quite well. I finished the book then reached for my crossword book just as the snack angel wheeled her cart back into the room. It was about seven o’clock now. Outside it was black. It felt as if it were midnight. This late in September, the evening light had fled. She offered me yogurt, orange juice, milk, cheese sticks and digestive cookies. I took cookies for later and ate yogurt and cheese. I finished one half-done crossword puzzle and I had enough. I returned to the kitchenette looking for a hot drink. Styrofoam cups were the only kind available to heat hot water in the microwave. Fearing a melt down and a splash of scalding liquid, I had to find something else. I wouldn’t be able to cope with a mess. So I retrieved my yogurt container and hoped it would be somewhat less likely to melt. I made my coffee and downed two Sankas in rapid succession, thankful for its hot sweet taste. I was conscious that in the morning, there would be none left to drink for breakfast. There was a sturdy supply of fruit teas remaining in the little box. I’ll get out of here as early as possible and go down to Starbucks in the lobby, I promised myself. I made two pieces of toast and loaded them with Becel, peanut butter and raspberry jam. I was still thirsty. It must have been the anesthetic and the fact that I’d had nothing to drink for sixteen hours . Creative hospital cooking was required. I took two containers of milk, heated them and sweetened them with raspberry jam. On my way back, I passed a dark skinned, short man cradling an infant so small it seemed that he was rocking a blanket with out a baby. “She’s colicky” he said in a whisper, looking up as I stopped to look at father and his new infant. “She’s quiet now” I replied just as quietly, as I continued past him, back down the corridor. Back in my cavernous room, I reflected that it was good to take a day or two to do nothing, to sleep, to meditate, to read, to observe, to think. I began another crossword and quickly bored with it, I returned to the bed to sleep. I awoke in the middle of the night, remembered that the nurse had mentioned I could always see the time by the television if I just turned it on. It was four thirty and I was wide awake. I had no interest in the puzzle and my book was finished. I put on my slippers and went to the window, all the while listening to the strange raspy sounds of discontented infants on the other side of the walls. The night was a canvas of midnight blue with four sodium vapour street lights pouring orange halos around and about themselves. There were other neon and fluorescent lights that seemed like pin pricks in the fabric of the dark night. Across the way was a street level parking lot with lots of underground lighting. It was late and there was little activity. Occasionally a car would drive by with it’s amber tail lights glowing. Up high, there were two cranes with blinking white and red lights meant to warn planes that a structure was there. Soon there was nothing more to see. I went back to bed, got the covers arranged around my feet and up to my shoulders and tried to sleep. About seven in the morning, the food server came round and announced breakfast had arrived. I sat up briefly then promptly lay back on the bed, falling into a troubled sleep. I dreamt that I was in a parkade, driving out of it by driving down a staircase. At the landing, I was having trouble getting the car turned around and realized I should have driven down the ramp. With much manoeuvring, I turned the car around and drove back up and then towards the ramp. A tall hooded figure in a grey cassock held his hand up for me to stop and I did, parking the car, and returning with him to the third floor. The apartment was motel-like with a balcony just outside the door. I could see down into the lovely garden and across the harbour, just like at the Empress hotel. I heard steps outside on the staircase but could not see who was coming up. Two women who were with me announced, “Mrs. Stepford is coming. That was her car you could see just now.” But I could not see it. I exchanged banalities with these women about weather and clothing and children. All three of us went back inside the apartment just as two elegant, grey-hooded figures appeared at the door and entered. In a deft motion, the two women and one monk figure departed, leaving me with a tall, gracious man, clothed in this fine hounds-tooth checked fabric that from a distance had appeared grey. The cowl slipped back slightly to reveal a younger Richard Chamberlain. He reached his fingers to a stray strand of hair and let them fall slowly, gently down my face. He took me by my shoulders and leaned forward slowly, kindly and brushed his lips against mine. The sensation was warm, sweet and promising. “Mrs. Kay, your breakfast is getting cold. You’d better get up and eat your breakfast. Call me when you’ve finished and I’ll take your blood pressure and your temperature.” blared the nurse’s voice. I struggled away from the warmth of the embrace and looked into the impassive face of the morning nurse. I shook my head a little for clarity. The dream was gone and the details of it hurried away after it. Eggs would have been nice. Even powdered eggs are edible. I lifted the blue plastic cover of the food plate. There on the dinner size plate were two unbuttered, soggy slices of bread cut diagonally. I quickly put back the cover on the plate. There was a blue thermal bowl of cereal. I lifted off the fitted plastic lid and found a lukewarm white gelatinous mass. It looked too much like paper paste and I returned the lid to the bowl. There was a small thin plastic cup of juice. I sipped it to identify it and couldn’t . It was probably made from concentrate and hadn’t been stirred. The water substance therein was unidentifiable. There were two containers of milk and a blue thermal mug of warm water. A fruit-flavoured tea sat beside it. I drank the warm water. It was time to go. I pushed the red button that was lashed to the side rails of the hospital bed. “Yes?” came a booming voice from the intercom system. “Yes.” I replied, and hesitated. What was I to say? “The nurse said she want to see me when I’d finished breakfast. I’ve finished breakfast,” I said. I hadn’t eaten a thing. Starbucks in the main entrance to the hospital was calling me. “She will come when she can” boomed the voice. I was mostly dressed from the night before; I’d gone to sleep half dressed in my street clothes. I felt safer that way. I completed my dressing including my socks and shoes, packed my few belongings and waited. I stood by the window looking out on the scene I had looked upon during a waking spell in the night. There was no parkade across the way. Under a flat grey sky, it was a hotel with a covered arcade at the ground level to keep rain off window-shopping customers. Behind the hotel, there were three new buildings under construction covered in the brilliant blue plastic that protects the plate glass windows and doors. High above them, swinging gracefully through the air were two cranes lifting construction goods from the stockpile of materials to other locations on the site. Between the new buildings and the hotel must have been a park with a grove of cedars and firs. I looked then at the flat roof just outside my window, a narrow roof not ten feet wide terminating in a parapet wall. The lack of maintenance was terrible but beautiful. I regretted not having my camera to photograph the thick moss clumps, bright, newly green and vigorous with the latest autumn rains. It was clinging to the layer of grey pebble ballast that was designed to keep the roof down in windy conditions. Tucked between the clumps of moss were lichens in a soft pale copper oxide colour, the earth colour artists call Terre Verte. Where the moss was thriving, tiny thin tendrils of a coppery coloured flower bunched on the top of the moss. Set in amongst the rocky ballast, a rose filter perched atop the drain to keep out leaves and other debris. It had a lovely geometric pattern of piercings. Oh, where was that camera?!!! From a Property Manager’s point of view, it was a disgrace; the moss was destructive, reaching it’s “roots, into the tar and ruining it’s waterproofing. From an artist’s point of view though, it was a marvel of shapes, colours, patterns and textures. The nurse returned and took my blood pressure and my temperature. I was fine to go. Only, she needed my doctor’s permission to discharge me. The doctor had just left ten minutes previous. The nurse paged her and fifteen minutes later, I was free. I navigated back to the elevator, descended to the ground floor, asked for and found the closest exit to the parkade and found the car. I left my goods and chattels in the trunk, locked it all up and went back to the coffee shop for the tallest decaf they had, and a fruit bar. The rest, my friends, is another story.